For many of us, planning looks like a straight jacket that hampers our creativity. We assume that creative people like entrepreneurs are better off without such bureaucracy and should just follow their instincts and test things using trial and error. As a romantic wannabe free spirit, I’d love to believe this story. But I’m a sucker for evidence and I can’t get away from the facts: planning is really valuable when it’s done well, ironically most of all for those creative free spirits. Properly managed studies of the benefits and drawbacks of planning come down firmly on planning’s side. It makes us better at reaching our desired state, more reliably, more quickly, with less effort, and with less wasted time in inevitable blind alleys. It helps us deal with distractions, recognise problems early, and refocus if we’re going off course. Just as having a well set goal makes it more likely we’ll achieve what we desire, having a well designed plan makes it even more likely once the goal is in place. Sadly, we see planning most often where it’s needed least and can even be damaging: large companies in steady state, planning more of the same; successful athletes looking at how to improve by doing more or harder sessions; and administrators misusing it to centralise decisions. And of course we see planning least often where it’s needed most: small companies working out how to grow; frustrated people working out how to change instilled behaviour to get very different results, like dieters and unsuccessful athletes; and talented people who want more power over their own destinies. We need planning most when, like our entrepreneur, we’re discovering and breaking new ground. When we’re just doing more of the same, we’re really repeating last year’s plan with higher targets. There are, of course, downsides to planning if we don’t go in with our eyes open. For example, we can end up head-down-arse-in-the-air focused in task completion and not recognise when it starts being a bad idea. But that is just bad planning and bad goal-setting; it’s possible to wield any tool badly, and wielding it well can mitigate those problems. Let me describe what I mean by planning. First, I assume you’ve got a goal, where you want to reach by when, which is tangible enough that you’ll recognise it when you reach it. If it’s a long term goal, you need to be passionate about it or you’ll be uncommitted, poor-performing and probably a little bitter. If it’s a short term goal, you just need to be clear what it is: sometimes we need to do tedious things as part of the big picture. If you haven’t got a goal, you need one before you start on a plan. If the goal is where you want to get, the plan is how you’re intending to get there. This includes all the things that planning texts cover: the order of events, how long each thing takes, what resources you need, what capabilities you need to have built or bought by when, who has responsibility for what, what is and is not on the critical path, check point goals to make sure you’re on track, etc, etc. You know all these things already, but you may not do them. Let me describe what a plan isn’t; and this isn’t in all the planning texts. It isn’t a detailed, linear path from where we are now to where we want to arrive, with no allowance for change or deviation. The plan is only as detailed as it needs to be to get us to the first check point, and no more detailed. We replan or review the goal after hitting or missing each check point. And if there’s any material uncertainty, as there is for most things, the plan needs to include what academics call an “if-then.” This last point deserves an article in itself, which I’ll write in due course. You might think the benefits of planning in complex environments, with multiple people, are painfully obvious. You wouldn’t make a ten man trek to the South Pole without a plan. But people in complex environments, treading less well-charted territory, like small business owners, resist it like a ball and chain, preferring trial and error and their mystical instincts. The top small business researchers, Delmar & Shane, tested how planing helped or hindered entrepreneurs. They studied 223 start ups for 5 years to see if planning was a good idea. In their results, the firms using planning developed new products more quickly, developed their operations more completely, and had less chance of failure than those that didn’t. In fact, planning was the single biggest factor the authors could identify, in the business’s control, that determined whether the business succeeded or failed. They gave three reasons for this. First, planning speeds up decisions, because it allows people to anticipate potential problems and identify missing information more quickly than trial and error: drawing blueprints for a house before starting to build it, versus just starting then realising you need to pull the floor up to put the gas pipes in. Second, planning helps people to schedule resources, communicate this, and work out where the bottlenecks are, with the added bonus it makes them better at estimating how long things will take; so there is much less wasted time and fewer delays. Third, planning enables people to develop specific steps to achieve their goals, which deters distractions and gets people to their goals more quickly. More on this last point later. Planning even helps the simplest activities that only involve one person. The evidence for this is also very solid, even for people who don’t do it naturally and for the most uninspiring goals. The most compelling example I’ve seen in research is of two groups of heroin addicts suffering withdrawal, who were given an objective of writing a CV by the end of the day. All had equal, measured commitment to the goal. One group had a relevant plan (“I will write the CV at noon”) and the majority completed it by the end of the day. The other group had equal commitment but no measured plan, and not one of them completed the CV. Researchers have got underneath how planning helps, even in these situations with minimal complexity, by looking at how the brain works. FMRI scans of brains show that planning actually stimulates a different part of the brain than goal setting. By planning, you’re accessing a more suitable part of your brain, designed for action, which finds completing tasks easier and is better at them. This explains why a well-formed plan is an even better indicator of whether someone will complete something than how committed they are to the end-goal. Goals researchers list four major constraints to achieving goals: not getting started, not staying on track, calling a halt, and overextending oneself. Planning addresses all four. How planning helps getting started is self-evident; without planning, we usually get started, like our heroin addicts, too late or never. Planning helps us stay on track by forcing our minds to think through how realistic something is and what it takes; and working to that plan helps us avoid tempting distractions that might pull us off track. Calling a halt becomes tempting when our short term goal isn’t inspiring, and more attractive tasks start to appeal. But once we’ve have a plan, with our brain in implementation mode, we are much more stimulated by plan completion than the nature of the goal. For most of us, the fourth area, not overextending ourselves, is probably planning’s biggest benefit. When we plan we see the reality of time and resources needed versus what’s available, we’re much less likely to take on additional tasks that aren’t related to our goal. Finally, and again this is verified by research, it’s mentally much less taxing to implement a pre-planned activity, than to constantly flit between doing and thinking of the end state. There’s a simple way to combine goal setting and planning to really good effect, which has been tested and proven in some solid studies, including studies of notoriously difficult exercise and diet goals. In these studies, it gives better results than goal setting alone or planning alone. The method is called mental contrasting with implementation intentions, or MCII. In MCII, we start with our desired outcome and then, very deliberately, contrast it with the reality of our current state. This Mental Contrasting stimulates much more realistic and higher quality planning of how we can get there from here than simply thinking of our desired end-state and ignoring the state we’re starting from. Only once we’ve established this Mental Contrast do we form our Implementation Intentions. The business and life coaching fraternity have for years used a layman’s equivalent of MCII, using the much snappier acronym of “GROW,” and this captures the essence of MCII in a usable form. The steps of GROW are to clarify the Goal, review current Reality, look at the Obstacles and consider a series of Options to get from here to the goal, and plan by thinking about the Way forward (or Who, Where and When). It’s a little simplistic, but it’s memorable and good for many situations. If you want more than a paragraph on GROW, there are dozens of articles and books on it; it’s even got its own Wikipedia entry. Of course, planning has its downsides, particularly if it isn’t done well. In the same way that goals focus the attention on achieving one thing at the expense of less valuable things, planning focuses the attention on getting one thing achieved, even after achieving it becomes a bad idea. This is why a good plan needs breaks to check where we’re going, ponder and readjust. Unlike Napoelon on his march on Moscow, we need to review and reorientate. 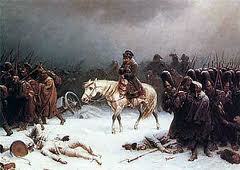 We can question Napoleon’s goal, but even if the goal had been wise, invading Russia definitely needed a plan. A good plan might have thrown up that the Russian winter would be an issue. Becoming a slave to the (bad) plan once typhus and then winter started setting in was not very wise at all. Planning and goal setting aren’t the problem; bad planning and goal setting are. So Are You Going to Start Some Proper Planning Then? I guess the decision about whether to plan properly ultimately comes down to an emotional choice. Do you want to resist the perceived planning straight jacket, and carry on being a free spirit who can’t be tied down? Or would you rather spend some time thinking ahead, and so achieve what you’re passionate about with less wasted effort, fewer false starts and abandoned projects, and as a result be more of a master of your own destiny? Ironically, I think the second path is a freer one.